The average family size in Gaza is 6 children. Some of those we help live within families of up to 12 people. 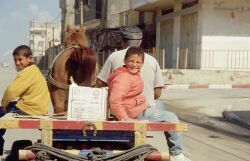 The unemployment percentage in the Palestinian Territories reachs to more than 40% in graduates and skilled labourers. Thousands of families have no income in the current Intafada. So the little dollars which we give monthly to the 21 scholars brings a smile on their faces and enough for them at least to buy good clothes and stationery. In fact, the charitable work here has huge positive effects on the local community. Not all charitable NGOs will see it, but the Dove and Dolphin and many others charities which treat directly with the people can read the appreciation in their eyes. Most Palestinian people are simple, but they are born politicians. They can differentiate between governments and their people. We are a British charity, and our office in Gaza is open 6 days a week. A lot of needy persons, students - even NGOs - come here daily asking for support and co-operation. This trust didn't come easily, but only by hard work and a chain of projects which we implemented. Donations to needy persons without a mediator has been a key to the respect we have earned.